ePosters - Temporal dynamics in microbial soil communities at anthrax carcass sites. 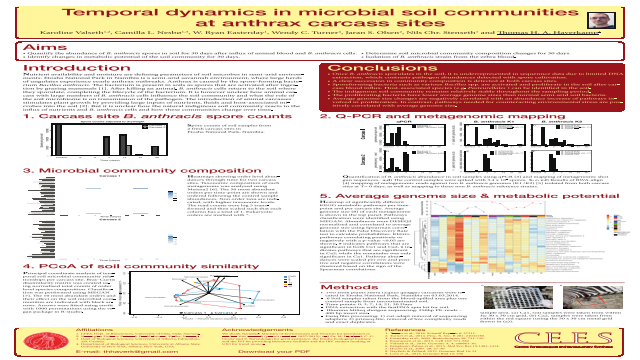 Poster Title: Temporal dynamics in microbial soil communities at anthrax carcass sites. Abstract: Nutrient availability and moisture are defining parameters of soil microbes in semi-arid environments. Introduction of animal carcasses provide large inputs of nutrients, fluids and host-associated microbes into the soil. One trigger for animal death is Anthrax caused by the spore-forming bacterium Bacillus anthracis. The bacterium is present in soils as spores that are activated after ingestion by grazing mammals. After killing an animal, B. anthracis cells return to the soil where they sporulate, completing the lifecycle of the bacterium. It is unclear, how animal carcass with large numbers of B. anthracis cells influence the soil community. We therefore studied microbial soil community dynamics over 30 days (Etosha National Park, Namibia), after decomposition of two zebra anthrax carcasses. Time-series metagenomics data showed that during the experiment the microbial community quickly changed and became dominated by the opportunistic orders Bacillales and Pseudomonadales with genomes enriched for metabolic pathways needed for proliferation. Bacteria commonly found in semi-arid soils (e.g. Frankiales and Rhizobiales) dominated at the end of the time-series. Those orders have pathways involved in desiccation and radiation resistance. Thus metagenomic data showed that anthrax carcasses have a substantial influence on the microbial communities of semi-arid soils. To avoid state-associated-challenges (i.e. vegetative/spore) we monitored B. anthracis, throughout the period. Using shotgun metagenomics, quantitative PCR and cultivation, we observed that vegetative B. anthracis abundances peak early in the time-series and then quickly drop, at which time they are replaced by spores. We find that DNA-based approaches underestimated total B. anthracis abundances, due to difficulty in DNA extracting from spores. Furthermore, current bioinformatic tools have difficulties differentiating between the very closely related Bacillus cereus group ‘species’. This suggests that DNA-based approaches of spore-forming bacteria in their natural habitat are insufficient for estimating their abundances. We show, however, that complementing DNA based approaches with cultivation may give a more complete picture of the ecology of spore forming pathogens. Summary: A study to analyse the dynamics of microbial soil communities after influx of zebra blood containing vegetative cells of the pathogen Bacillus anthracis. Shotgun metagenomics, quantitative PCR and cultivation were combined in order to obtain an community overview of the changes occurring after a zebra blood poured into the soil.